Experimente as emocionantes maravilhas naturais do sul do Oregon em um dia inteiro de rafting pelo rio Klamath Superior. Esta excursão familiar percorre 14 quilômetros de rio, oferecendo vistas fantásticas do cânion e da floresta e mergulhos emocionantes através de corredeiras contínuas. 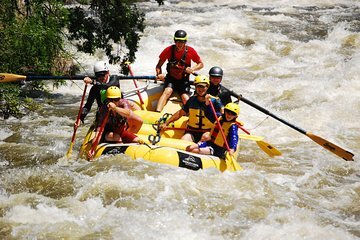 Com um guia especializado, aprenda técnicas de rafting e como navegar pelo rio. Você vai parar ao longo do caminho para comer, nadar e desfrutar de algumas manchas da vida selvagem. The rafting itself was excellent. The van trip to the embarkation point and the return, not so much. the van was...well, it was a very big, uncomfortable, not very clean, old van. Okay, all of these things are worth it for the payoff of a good day on the river. A lack of air conditioning in the 21st Century on a really hot Oregon day, not so good. Our guide Glen was excellent, knowledgeable, and very safety conscious, would raft with him again. Our van driver Robert was a good guy, and interesting. The lunch was average, but you of course are not there for the food.